Mark loses his smartphone, then turns to drinking. Mark and I got back to Hanoi Wednesday evening. We returned to our hostel and asked about Mark’s smartphone at the reception. Mark described the phone and explained when and where he left it behind. But, there were no smartphones in the lost-and-found. The receptionist promised to check the CCTV and get back to us. We figured that was the end of that; no more smartphone. Online, I found a normal mall in Hanoi without stores like Versace or Prada. The Vincom Center was a 30 minute walk from the hostel and near a restaurant Mark wanted to try out. We left the hostel early that morning and as we pass the reception, the guy at the desk apologized for not finding the phone after checking the CCTV. We assured him that it was, in no way, his fault. We hoped, but only somewhat expected, to be reunited with the smartphone again. We thought about buying a new smartphone at the mall if we found a cheap one. On the walk to the mall I saw a fresh new hole forming on one of my shoes. I told Mark, “I might not make it to the mall. Go on without me.” But I did make it to the mall with some semblance of foot covers left. In the mall, I found a Sketchers and looked through the shoes they had on display. I was in luck; they were having a sale. I picked out a few pairs I liked. There were many suitable athletic-casual shoes to choose from. “Do you have these in 42?” I asked the clerk. “No, the biggest size we have is 35,” she replied. I went into an Adidas store, a Nike store, and several other stores and they all said the same thing. There weren’t any women’s shoes in my size. My only options were the Converse and Vans stores, mainly because their shoes are unisex. But I didn’t want any of those; I wanted comfortable shoes that didn’t need to be broken in. I walked past a store with several brands of athletic shoes. The manikin wore a lovely pair of retro New Balance that were brightly colored. Mark says that I like ugly shoes, which I guess I do. But, they have to be the right kind of ugly. These were the right kind. I went in and asked if they had the manikin’s shoes in a 42. They didn’t. Their largest size was a 39. That was the largest women’s shoe size I had heard all day. I asked if they had any women’s shoes in a 42. They did; flip-flops. I huffed. “Seriously Mark, you know nothing!” I tried to explain to him, the pedestrialy uncultured, all the integral differences between men’s and women’s shoes. “Men’s shoes are wider for one. For example, find a pair of those shoes in a 42.” I pointed to the men’s version of the shoes I wanted. “I can get the right size, but they will feel too big, because they are wider,” I announced. Mark found me a pair of blue ones. I took them from him. I sort of liked them, but thought, “too bad they are for men.” I put the shoes on and laced them up. I walked around in them for a bit. I wanted to proclaim, “See, they are too big,” but they fit. “Well?” Mark stood there waiting for the verdict. They were on sale at 65% off. The women’s shoes, which started out at a higher price had a smaller percentage off. I gave the sales clerk 35USD in Vietnamese dong and took my men’s shoes. I then sat down somewhere, put on my new shoes, and placed my Merrells in the New Balance box. Then a few blocks away from the mall I placed the box on a trash can on the side of the road. Mark is a fan of Anthony Bourdain’s shows. I am too. Mostly, I’m envious of Bourdain. He flies all around the world on someone else’s dime to eat food and then they pay him. He gets paid to travel and eat! In one episode of Anthony Bourdain’s Parts Unknown, he and President Obama go to a bun cha restaurant in Hanoi. This was where Mark took me. We found the restaurant and went in, but there was no place to sit. It was crowded, but there were stairs. We took the stairs, but still there was no empty table. But, there were more stairs. We kept going up until we reached the last floor for dining. There, we finally found an available table. This place only serves one main dish, bun cha, and two types of sides, seafood rolls and crab rolls. The menu is very sparse. But let me tell you a little secret. Most of the time, when a restaurant only serves one thing, it means they are really good at making that one thing. And, the ingredients are more likely to be fresher. We ordered the Obama Combo with the seafood rolls. It was so meaty, so flavorful, so good! The bun cha tasted like barbecued soup. The fried rolls were great too, but the soup out shone them. I loved how vegetable heavy the meaty soup was. At some point in the meal I realized that I could not eat it all. I abandoned my roll to give more stomach space to the bun cha. Got to stay cool in this heat. After lunch we walked around the streets of Hanoi trying drinks and eating ice cream. We tried fancy ice cream at Fanny. They had many flavors, some we hadn’t heard of before. Then we tried ice cream sold on the street from a cart being pushed by a young man. His ice cream was green, but we couldn’t tell what flavor it was. Maybe, it was matcha? In the evening we went to a water-puppet show. It is more interesting than it is entertaining. It’s all in Vietnamese, so I’m not sure of the details of the story. I saw this show 9 years ago the last time I was in Hanoi, and from what I can remember the story is the same. 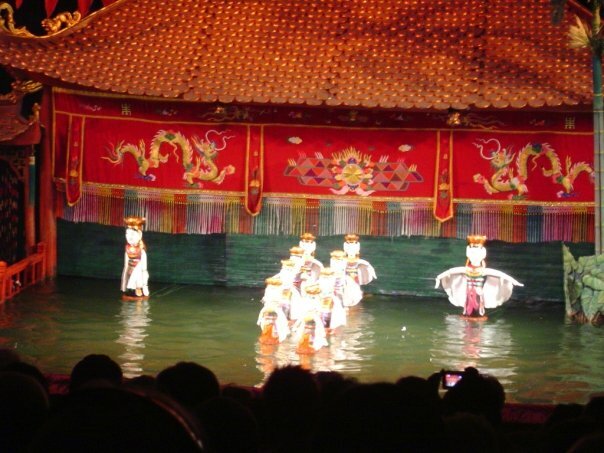 The great thing about the water-puppet show is that it is indoors in an air-conditioned room. But there was one old lady who thought it was too cold. There was an empty seat next to Mark. I don’t know where she was before, but about 10 minutes into the show she plopped herself into the chair and demanded Mark’s attention. The lady mimed that she was cold and continued to point to the nearest fan. She pulled on an invisible cord and pointed to Mark. Mar,k realizing what she really wanted, concluded that the woman must be mad. Not only did Mark not want to make the place warmer than it already was, he had no desire to mess with things he ought not to touch. Mark turned his head away from the lady and pretended he could not see her. “Fine,” I imagined her saying to herself. “Can’t send a man to do a woman’s job.” She got up and walked over to the fan. She stretched her short arms up as far as they could go. She was too short. To be fair, Mark would have been too short too. It was out of the reach for any human. I’m sure they did that on purpose so people would not keep yanking on it during the show. This little old lady was not the first of her kind. “Whatever,” she probably muttered to herself. “There are plenty of tall foreigners around. She did not return to the seat next to Mark. She moved to an empty seat in the next row up. By this time, I was completely ignoring the water-puppet show. This woman was far more entertaining. I kept peeking from around Mark’s shoulders to see what she would do next but not wanting to be seen. She found a French guy. He was tall. She tapped him on the shoulder and gestured her delight of his height. He nodded a thank you, but clearly wanted her to sit quietly so he could enjoy the show. She tapped his shoulder again. “Wow, you’re tall!” she said with her eyes and out stretched arms. He whispered something in French. “Yes, I know,” or maybe “I’m 193 meters.” She said something to him but he waved his hands at her cutting her off. Then he pointed to the puppets. She pointed to the cord dangling from the nearby fan. The man thought she was pointing to the entrance to the theater that most of us walked through before the show started. He got up and went over to the door. Thinking that she couldn’t open it, he opened it for her. There was no difficulty in opening the door. He looked at the woman. She got up from her seat and stood under the fan. She reached out to grab at the cord to demonstrate that she could not do it herself. He looked at her as if just noticing her insanity. He reached up to the cord. It was far beyond his reach. The woman squealed with delight and encouraged him to get him to try harder. He shooed her away with his hands and mumbled, “Leave me alone,” in French. Not deterred in the slightest, the old woman moved another row up. There was another empty seat next to another tall guy. This one had seen what she was up to and actively ignored her. She tried waving at him and saying, “Hello, hello, hello.” But, he blocked her out. She tried to move another row up, but there were no more empty seats. She went to a seat in the front row. I kept an eye out for her. Five minutes later she popped up again. She had the attention of a theater usher. She whispered her complaints in his ear and he nodded in agreement. “Oh no,” I wondered. “Is he actually going to turn off the fan like she wants. The usher stepped out the door for a split second. He re-entered with a long pole. It had a hook at the end. With the hook placed into the loop at the end of the fan’s cord he gave the pole a sharp little tug. The old woman looked pleased. Then the man did the same thing for three other fans up the walkway. The lady’s smile drained away when she noticed that the fans had not been turned off, but turned up. There was nothing she could do. The usher continued turning fans up and then left the theater. Mark and I laughed. This was exactly what Mark wanted. It was a little cooler. After the show we had dinner and headed back to the hostel. We picked up our backpacks and waited for the receptionist to call us a cab to take us to the train station. As we waited, a staff member, came over to us. He was the receptionist from the night before who we had ask to check the lost-and- found for Mark’s phone. “I do, but it’s alright. I’ll…” But Mark was cut off. The guy told us that a new employee found Mark’s phone. But, he didn’t know where the lost-and- found box was. So he wrapped the phone in paper and wrote a message about it in his shift log. This is not how things are normally done, so no one knew what the paper-wrapped item in the desk drawer was. But when this clerk read the new employee log to check up on him, he knew that the thing wrapped in the paper and Mark’s phone were one in the same. “Is this your phone?” the guy asked pulling Mark’s phone out of his pocket? free “fresh beer” from 18:00 to 18:30. Towels & sheet are provided and changed everyday. I recommend ordering an airport pick-up through the hostel. This is a normal mall in Hanoi. There is a really nice game center here. It is very near Hoan Kiem Lake. Ask anyone in the area and they will be able to point you in the right direction. Shows last for about 50 minutes. Our first day in Vietnam Mark and I were very tired. We had been traveling for almost 24 hours by the time we got to Hanoi at 8AM local time. It was about 9:30 when we got to the hostel, but check-in time wasn’t until 1PM. 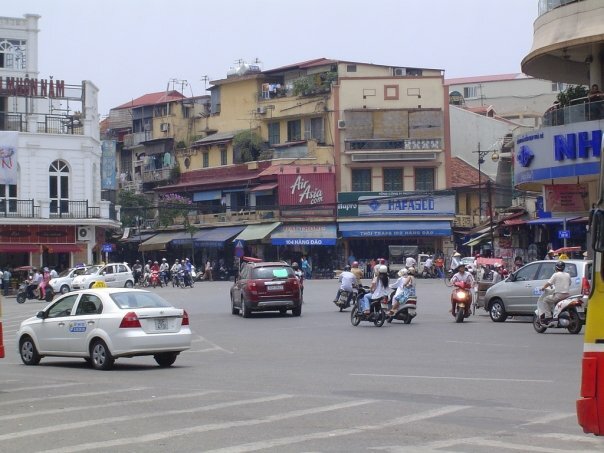 We had them hold our bags and went out to eat and explore the Hanoi. Hanoi is not an easy city for walking. One must be very vigilant not to get run over. But even in our exhausted state we managed to get to the Hoàn Kiếm Lake without being harmed. We walked around the lake for as long as we could then went back to the hostel and waited for 1-o’clock to come. Once checked-in, we showered and went to sleep. Around 4PM we went back to the lake for phở. Over dinner we discussed our game plan for our time in Hanoi. We would do one thing per day and nothing more. On Saturday our one thing was to visit the Hoa Lo Prison. This place has seen so much suffering. The prison was built by the French to torture the Vietnamese. Then taken over by the Vietnamese to inflict pain on POWs and other Vietnamese who had pissed off those in power. Next we went back to Hoàn Kiếm Lake. The area around the lake is closed off to traffic on the weekends. So, instead of cars and scooters whizzing around pedestrians, there were kids in Power Wheels and carts made from hoverboards. The kids were cute, but I trusted their driving even less than I did their adult counterparts. On our lake walk we came upon a mall. I needed new shoes and decided I’d look for a pair in the mall. Most of my clothes and shoes are labeled “Made in Vietnam” so I thought I could find an affordable pair there. I knew better than to travel with new shoes. I had a comfortable pair of waterproof Merrells that were several months broken in. By the time we started this trip they were at the right stage of worn in and I hadn’t needed to put a band-aide on my heels while wearing them for about 4 months. Walking through the airport in Hong Kong I noticed a crack in the leather on the toe of my left shoe. On my first day in Hanoi there was a hole where the leather meets the sole on the side of my right shoe. Then each day after that, I discovered a new hole, crack, or tear. My shoes were falling apart quickly. I didn’t know how much time they had left. I don’t have the money to shop in a mall with marble pillars. The first store in the mall sold just Prada, the next just Gucci. I walked past a Versace store looking for something more in my price range. I found a Gap. The Gap doesn’t sell shoes. We found an Adidas store close to the top floor, but all they had were light, small-sized, overpriced running shoes. I needed something sturdier that would fit my US women’s size 10 feet for a reasonable price. On our way back to the hostel we stopped off at a travel agency. There was a post on the side of the building of Halong Bay tour packages. The agent came out to tell us about all the trips she could offer. Mark and I asked her about the prices of the various trips. “How much is this 2 night 3 day tour?” one of us would ask. “Let me call someone about that one.” The agent would then phone someone and 2 minutes later she would give us a price. I didn’t have a pen on me at the time, but she had one. I kept asking her to write down the prices for me, but she won’t. “After you pick one, I will write down the information you need,” she would tell me. “You should choose now because the price will go up,” she warned. I didn’t like hearing that. Why would the price go up in a matter of hours? Why did she have to constantly call someone else about tour package prices? I was suspicious. We left, promising to come back with no intention of doing so. Tour agencies are a dime a dozen in Hanoi. I was sure we could find a better one. Within 10 minute we did. Mr. Manh and me with a bottle of water he gave me. There was one a stone’s throw from our hostel. It had several tour packages on display just like the first one. The major difference was that there were also prices for the tours painted on the display too. Because of this we knew we would pay the same price for a tour as everyone else who came into this agency. We talked to Mr. Manh. He was the owner and he spoke about the tour like he knew what was going on. There was no calling any mysterious people to ask for prices. We settled on a tour and paid for our tickets. Later we had the chance to talk about tour prices with other travelers in Halong bay. We all paid roughly the same amount per person. Mr. Manh was such a lovely guy. The next day he saw us walking back to our hostel. He ran out to us and handed each of us a bottle of water. “It’s a hot day. I think tourists don’t drink as much water as they should. Take these.” Then he bid us a good trip to Halong bay and went back to his office. On Sunday we tried to go see Ho Chi Minh. I saw him the last time I was in Hanoi. Then I was on a group tour of the city. The group tour had a reservation and skipped part of the line. Even with the skip we stood in line for 20 minutes. This time Mark and I did not go with a group tour. We got up early and left our hostel around 7AM. The place opens at 8AM. We set off on foot and got to the mausoleum half an hour later, then tried to get in line. What we thought was the start of the line was the skip area for people with reservations. We walked even further back. About a mile and a half beyond the reservation skip section, was the start of the line. And the mausoleum hadn’t even opened yet! We got to the back of the line and just kept going. The line was too long. We went to the nearby botanical gardens instead. Then walked back to the lake. 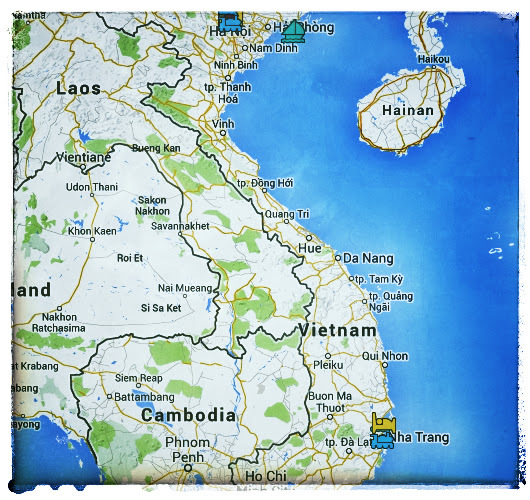 That’s how we spent the first 3 days in Vietnam… along with all the eating and drinking. I have a check list of foods and drinks to try while in Vietnam and have add more stuff to the list. Creamy, sweet, and avocado like. I liked it. Mark didn’t. What does that even mean? It tasted like regular milky iced coffee. I don’t like coconut water, but Mark loves the stuff. When he was done, the waitress opened it for him and he ate the jelly inside. I LOVE coconut jelly. This is actually a drink from Korea. I couldn’t remember if it tasted like my beloved Calpis. It didn’t. It tasted like weakly flavored soda. It was creamy and coconutty. If you like coconut, you’ll like this. It sounds weird, but it’s very creamy… heavily creamy. Stir well before you start. I didn’t and drank the top sweet creamy half before drinking the bitter espresso on the bottom. Every restaurant in Hanoi sells shakes and smoothies. Most are real fruit blended with yogurt, milk, or just ice made after you order it. Sometimes they add lots of sugar, sometimes the only sweetness comes from the fruit. Mark hated it. I loved it. The combination of coffee and yogurt tasted a bit like West Indian Vitamalt mixed with milk. deep-fried spring rolls. It’s flaky and greasy and wonderful. Pho with beef. It’s starts off plain but delicious and you add spices, pepper, and limes to your liking. It’s very good when done well. For about 4USD you get a pork soup, noodles, vegetables, over stuffed deep-fried spring rolls, and a beer or Fanta. This is where Obama and Anthony Bourdain ate for the show Parts Unknown. It tastes like BBQ soup. It’s meaty and great. The best part of the coconut. Spring rolls not deep fried. I love all types of spring rolls. Macha flavored ice cream on a stick. Baguette sandwich made with Vietnamese seasoned meat. Mark can’t get enough of these. 20,000 ₫ for the pamphlet. All the information in the pamphlet are written in English on the walls throughout the prison. It is about a 30 minute walk from Hoan Kiem Lake in Hanoi. It shouldn’t cost too much to take a taxi, motorbike taxi, or a cyclo. It is free to enter, but you are not allowed to bring anything like a purse, camera, water bottle, etc in with you. There are lockers you can rent for a fee. If you are on a tour, your tour guide will hold your stuff for you. After my trip to Ha Long Bay, I had one more night in Hanoi. When backpacking I think it is important, every now and then, to spend a day doing nothing but wandering around the city aimlessly. I like to pretend that I live in whatever city I’m visiting and just do mundane things like read a book on a park bench or buy fruit. 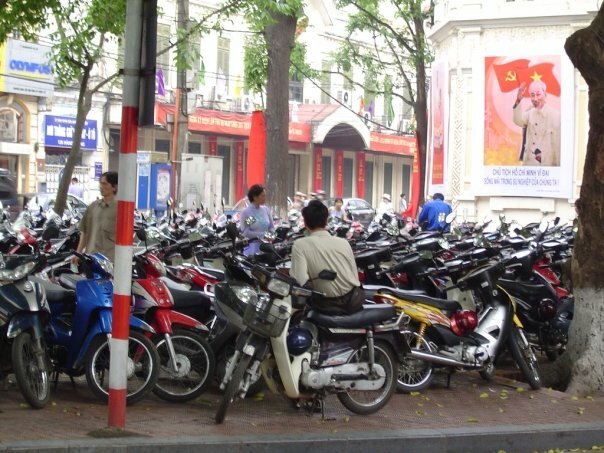 As I roamed Hanoi that day, I realized how impossible it is for anyone to just walk down the street quietly. I had to walk while constantly saying, “No, thanks”, “I don’t want any,” or “I already have one,” to all the street vendors. The most aggressive of the vendors, were the ladies who sell pineapples. 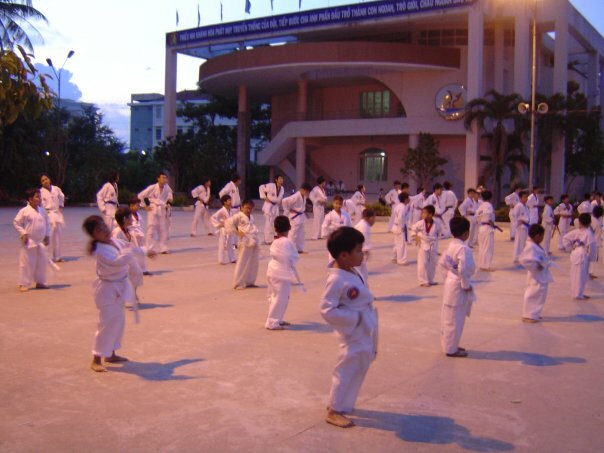 During my short stay in Hanoi I would be chased for blocks by two or three of them at a time, whenever I went out. I can only eat so many pineapples before my mouth gets sore! I had a long train ride to Nha Trang and I wanted some fruit to take with me on the journey. I wanted to try some new fruit. I can buy pineapples and oranges anywhere. 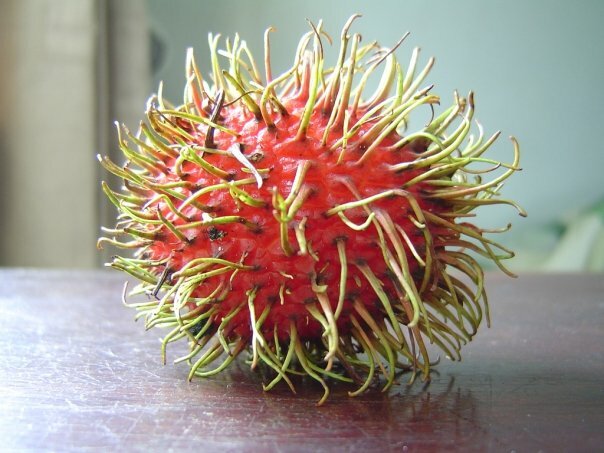 I was dying to sink my teeth into some crazy, funky Vietnamese fruit that I had never tried before. I had seen ladies selling unique looking fruit as they walked down the street. They always seemed to just wiz right past me not giving me a second look. On my last day in Hanoi, I stopped one of them. She had some sea-urchin looking fruits in one basket and small black round fruits in the other. The baskets were balanced on her back in a yoke-like device and she walked as if she were late for a very important meeting. I had to grab her arm because she was going so fast. She stopped to look at me as if she thought I wanted to mug her. I asked her, “How much?” She didn’t understand me. I pointed to both baskets of fruits with both my index fingers at the same time. While I was paying her two motor bikes crashed into each other head on, spilling cases of Tiger beer into the street as a result. Both drivers were fine, and in the commotion I was able to sneak away from the pineapple people without them noticing. You Own Me 10,000 Dong! That evening, I left Hanoi for Nha Trang. When I got to the train station I showed my ticket to the uniformed lady at the door and she let me in. As soon as I was inside, some guy in a uniform came up to me, grabbed my ticket, and told me to follow him. I noticed that his uniform was different from those of the station workers. So, I grabbed my ticket back from his clutches and headed for the train. There was only one train in the tiny station so it wasn’t difficult to guess which one was mine. I walked quickly, slipping through the crowd alongside the train to get to my car. The man chased after me. He was yelling at me and complained that he had shown me how to get to my train and now I owed him 10,000 dong. I stopped and turned around to look at him. He was still running behind me and needed a little time to catch up. I told him, “Actually, you are following me. So YOU owe me 10,000 dong.” He didn’t think it was funny. He walked away feeling dejected and probably cursed me. 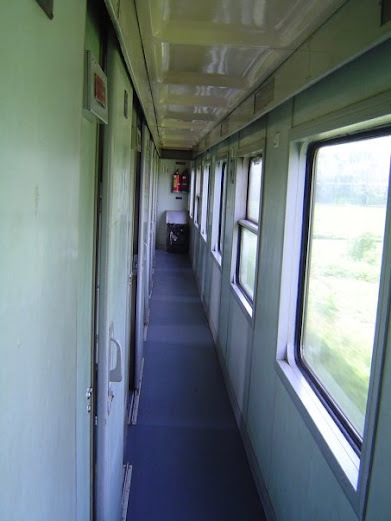 The cheapest thing to do is to take the train from Hanoi, or wherever you are, to Nha Trang. This is a 30 hour train ride. You can buy your train tickets at any hotel, hostel, or shady looking travel agent selling on the sidewalk sitting on a cardboard box. Though I would recommend that you buy your ticket from a place that looks like it will be there again tomorrow. There is also an airport in Nha Trang. 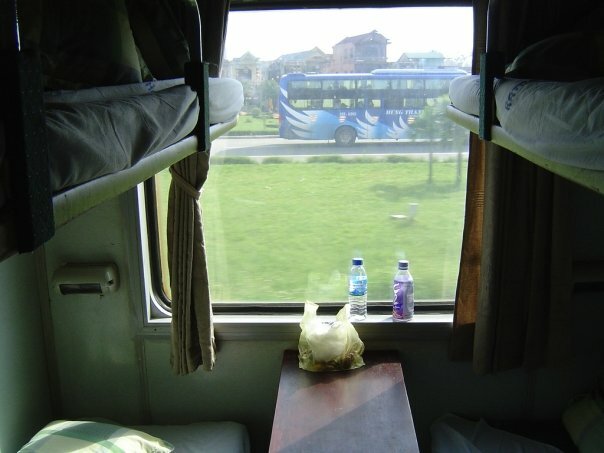 I bought my train ticket through the Hanoi hotel in which I was staying, Hanoi Blue Sky Hotel. The bus dropped me off somewhere in Hanoi. I had no dong and no plans, but I met a cute couple from my bus. We chatted at one of the rest stops. They had reservations at a hotel in Hanoi and planned to take a taxi there. Since it would cost nothing extra for me to ride in their cab they told me that I could join them. Once again I would like to say that I love the name the Vietnamese picked for their currency! Once we got to their hotel, I was told that it was fully booked. The receptionist, who happened to also be the owner of the hotel told me that she and her sister owned another hotel. She called a guy who she referred to as “little brother” and told him to take me to the other hotel. I hopped on his scooter, shoved my afro into a helmet, and held onto my backpack. He took me to the Hanoi Blue Sky Hotel. When I got there, the receptionist, who happened to be the sister of the first lady, started to check me in. (I’m not sure if they were biologically sisters or just good friends.) When I told her that I didn’t have any dong, she said that it didn’t matter, “You pay when you check out. This not China!” I loved her instantly. I ate dinner at the hotel because I could put that on my bill and pay it later. I even signed up for a few trips. I knew that I would find an ATM at some point before I planned to check out or at least stay until I found one. If all else failed I could pay in US dollars or Euros, both are welcomed if not preferred over the dong. HSBC was my bank of choice. They have ATM’s in many countries. When I got money in Vietnam from an HSBC ATM, I paid no ATM fees. I have since closed my account at HSBC because it’s hard to talk to a human when I call. I have to know a hundred and one codes just to log in or call. And there was something else… oh this. In the hotel by the front desk, were posters of day and overnight trips. There was a book that had the trips laid out in detail, with prices for different levels of accommodations. One great thing about the Hanoi Blue Sky Hotel was that the sisters who own it, also owned a junk on Ha Long Bay. 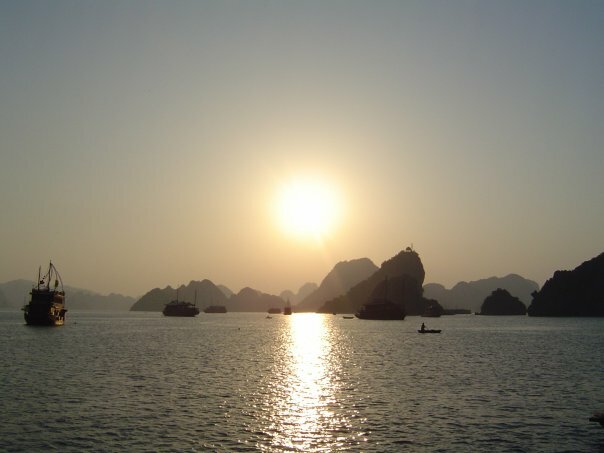 A trip to Ha Long Bay is a great way to get ripped off if you don’t know who to book your trip through. I usually don’t like tours, but I was traveling alone and wanted to meet some people. There was also the additional benefit that while on a tour, I would not get lost. 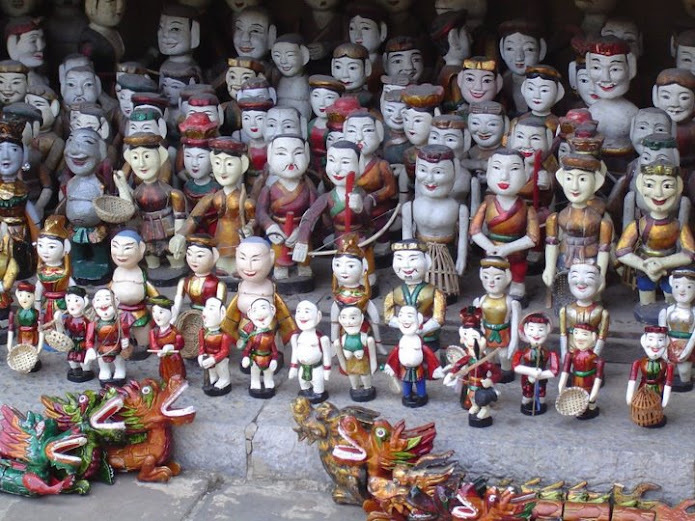 I picked one of the Hanoi City tours with tickets to see a water puppet show in the evening. We first went to The Ho Chi Minh Mausoleum. Uncle Ho looked a bit creepy, but the man has been dead for almost 40 years. He was the first dead communist leader I had ever seen. I would end up seeing many more. Actually, only two. Kim Il Sung and Kim Jong-Il has still eluded me and it turns out that they eventually buried both Stalin and Evita Perón, not that Eva was a communist or a leader. Next it was Ho Chi Minh’s vestige right next to the Mausoleum. I loved that the house he chose to live in was so modest with 3 or 4 BMWs parked out back. I’m sure it’s what the people wanted. But the grounds of the museum was interesting. There were many displays of housing for the plethora of peoples who peopled south-east Asia. 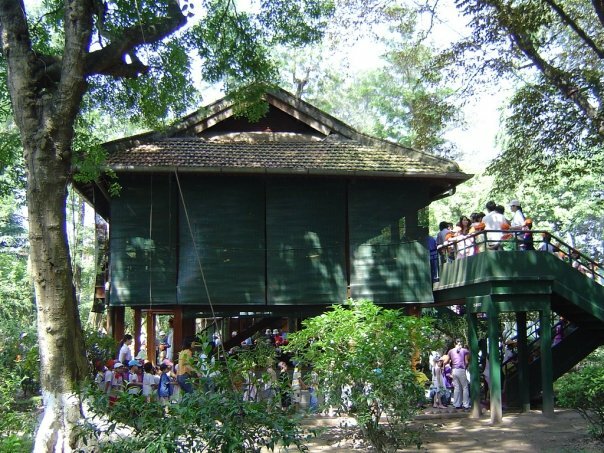 Tourists are encouraged to climb in, on, up, and around the structures. And I did! Plus there were some very interesting fertility tombs. Though, I think that once you’re dead, you’re pretty much infertile for good. We passed by a few forgettable temples. 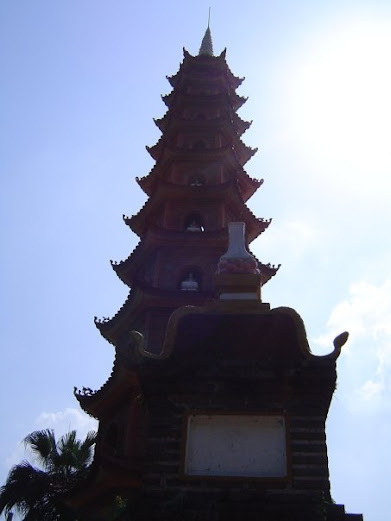 The only one that stood out in my mind was Ngoc Son Temple which was in the middle of the lake. There were some monks doing some serious praying that day, but I don’t know what for. Then there was the Thang Long Water Puppet Theatre. The water puppets show was all in Vietnamese and lasted 50 minutes. It got boring within the first 10 minutes, but the theater had air-conditioning so I stayed. It was worth all 20,000 Dong (2 dollars at the time) of the ticket price just to cool down! As an America, I needed to have a visa before entering. *While looking up information on The Hanoi Blue Sky Hotel, I noticed that the name has changed. They might have redecorated too. 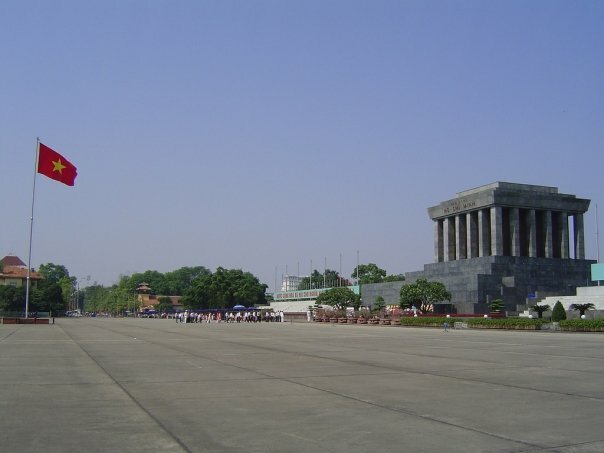 You can book tours of Hanoi and to Ha Long Bay here. You can pay to have your laundry done here. 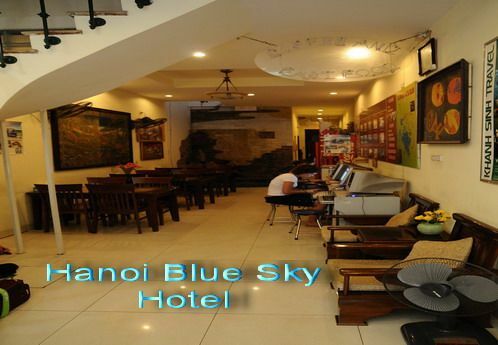 You don’t have to stay at Hanoi Blue Sky Hotel or any of the other sister hotels to book a trip or tours with them. 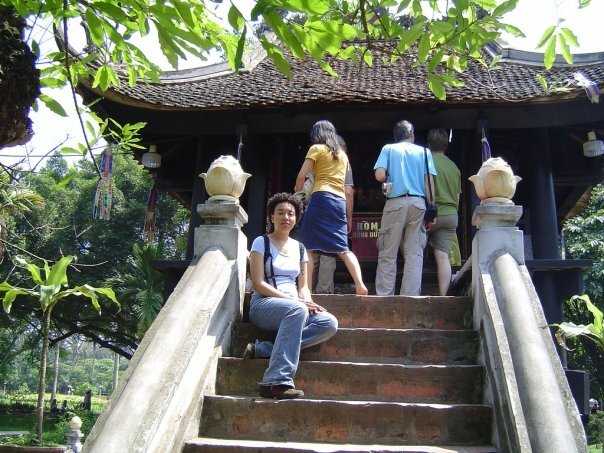 It is about a 30 minute walk from Hoan Kiem Lake in Hanoi. It shouldn’t cost too much to take a taxi, motorbike taxi, or a cyclo. You can also take bus #9 or #14. 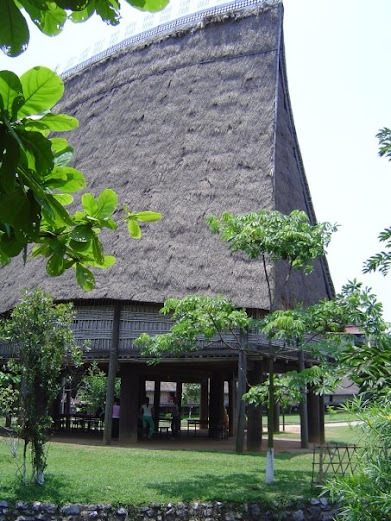 The Museum is located in the Cau Giay district, twenty minutes by taxi from the city center. 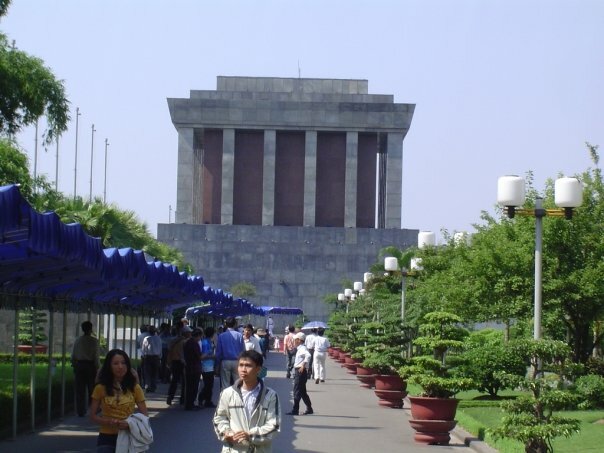 Take the #14 minibus which runs from Dinh Tien Hoang Street, north of Hoan Kiem lake, to the Nghia Tan stop a few blocks from the Museum. Don’t forget to check out the grounds. 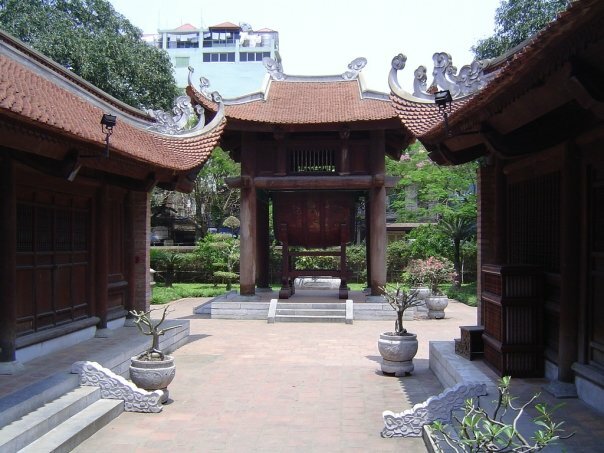 It’s the shrine in the middle of Hoan Kiem Lake. 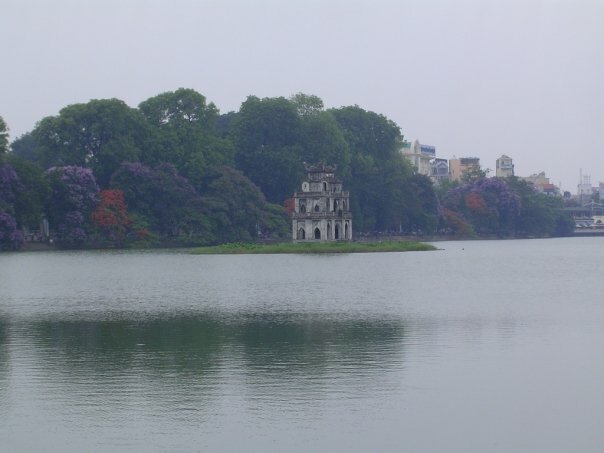 Hoan Kiem Lake is in the tourist district of Hanoi. Most hostels or hotel worth visiting are within a walking distance of this lake. If you have a hard time finding this place, just stop anyone walking around and ask them for directions. 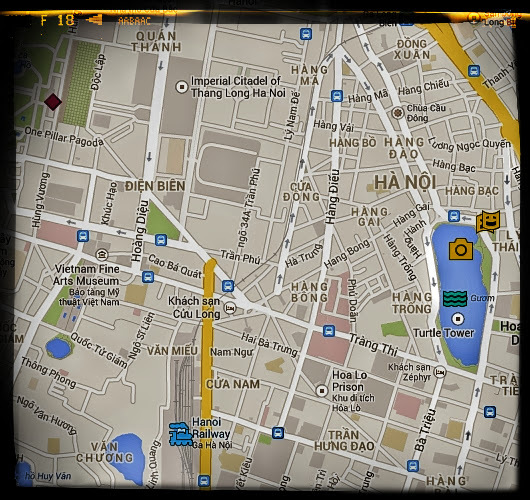 Remember that you can get a free map from just about any hotel or hostel. It gets pretty hot in Hanoi during the day. It might be a good idea to walk around this place in the evening rather than in the middle of the day. 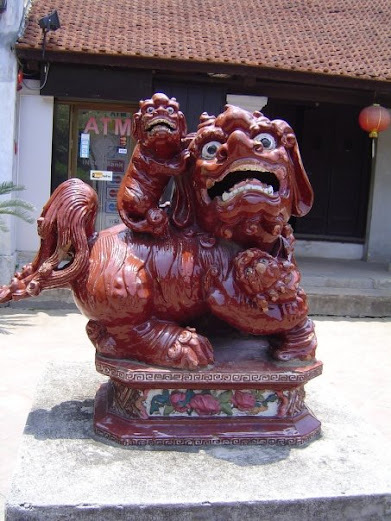 You could even end your walk with a visit to the water puppet theater. It has air conditioning! with an extra .50USD if you want to take photos. Shows last for about 50 minutes. The first show starts around 13:45 and the last around 20:00. There is a 9:30 show on Sunday mornings. It’s one of the few things in town with air conditioning!